This paper mache standing skeleton is a unique and fun addition to Dia de los Muertos decor. A combination of Catholic and pagan traditions, Dia de los Muertos is an important Mexican national holiday. Celebrate and honor the lives of deceased loved ones this Day of the Dead holiday with your own altar display. 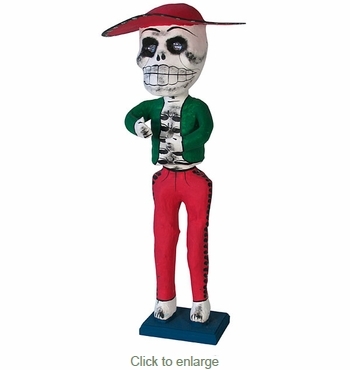 These paper mache skeleton figures are handcrafted by artisans in Mexico. Expect variations in color and design.